A SUICIDE. A MURDER. A CONSPIRACY. DIGGING UP THE PAST CAN BE DEADLY . . .
A thirteen-year-old boy commits suicide. A sixty-five-year old man dies of a heart attack. Dan Forrester, ex-MI5 agent, is connected to them both. I have enjoyed the CJ Carver Forrester and Davies series from the first installment. In Know Me Now, partial amnesiac Dan Forrester is back, back in another adventure for our enjoyment, and also back with his wife, Jenny, and their daughter Aimee. The family is eagerly awaiting the imminent birth of Dan and Jenny’s second son. Dan is also dealing with the sudden death of his father, Bill, who was visiting Germany when he had a massive heart attack. In the midst of making arrangements for the repatriation of his father’s body, Dan hears that his 13-year-old godson, Connor, has also died. Connor’s death is being dealt with as a suicide, but the local doctor in the Scottish village where he died is not so sure. Two deaths so close together – and as the delightful DC Lucy Davies says: “In my job, we don’t believe in coincidences”. CJ Carver certainly does believe in coincidences, the local GP who is suspicious about Connor’s death is none other than Dr Grace Reavey – one of the main characters in the first Dan Forrester outing Spare Me the Truth. 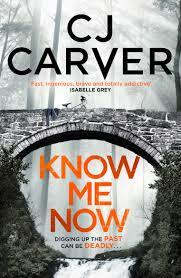 I have come to realise that through this series Carver is weaving us a maypole of connections between her central characters. Given her skillful plotting, I am sure there are more reveals and connections to come, and with Dan’s dodgy memory, goodness knows what he has forgotten from his past!